In order for this analogy to be applicable, Ahn Sahng-Hong would have to have written that Um Soo In was a “false god the mother”. Let’s take a look at what Ahn Sahng-Hong actually wrote in his book Problems With New Jerusalem regarding this issue. A presumed member of the WMSCOG argues that, “the Holy City Jerusalem is a symbol being used to represent our Heavenly Mother“. Ahn Sahng-Hong completely opposed the idea that Sarah represented the Jerusalem from above, but that is exactly what the WMSCOG believes. 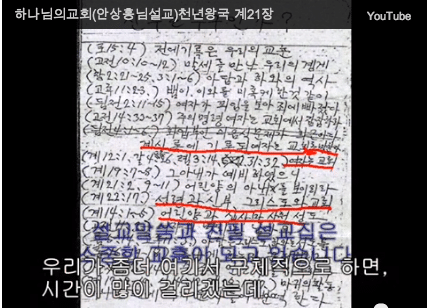 Ahn Sahng-Hong also completely opposed the idea that a woman could be the Jerusalem from above, because according to his interpretation of Galatians 3:16, that would mean that whoever that woman was, she would be the mother and the bride of Christ. Ahn Sahng-Hong described this notion as “extremely disgraceful“. How is this different from the WMSCOG’s interpretation of Zhang Gil-Jah being the New Jerusalem and the the bride? It is not different at all. In fact, at the end of Chapter 7 Ahn Sahng-Hong goes as far as to say that Um Soo-In was a “false prophet” with “weird delusions”. My guess is that Ahn Sahng-Hong would have similar things to say about Um Soo-In’s copycat Zhang Gil-Jah. 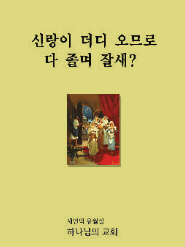 In summary, the only thing that this book proves is that Ahn Sahng-Hong opposed both Um Soo-In’s and the WMSCOG’s conclusion that there is a “god the mother”, regardless of which Korean woman claims to be her. WMSCOG is an organization opposed to truth which it wanted the false to be the truth. It’s foundation is all falsehood and though their false god and false christ opposes the idea of a mother god, it’s of no use because the man is dead and in no way can defend himself. At this point in time, this not so important because already the false doctrine of worshipping a dead man and his living concubine should already be sufficient to prove that WMSCOG is the church of SATAN. I was just thinking about the thought process here. There’s a fake mother god so there must be a real mother god. What??? Going with that kind of thought process, there’s a fake Jackalope so there must be real Jackalope. There’s a fake Fiji mermaid so there must be a real Fiji mermaid. Obviously there are flaws to this kind of thinking and only someone trying to manipulate others would try to use this school of thought as some kind of proof. This is some seriously flawed thinking. There’s a fake god the mother so there must be a real god the mother? With this kind of logic you have to believe that if there’s a fake jackalope then there must be a real jackalope, if there’s a fake Fiji mermaid then there must be a real Fiji mermaid, if there’s a fake Santa Clause then there must be a real Santa Clause. Is there anyone that really wants to follow this train of thought down this dirt road? but in reality the idea of “mother god” already is a flaw so either which leads to a dirt road. must find another way. a dirty road is real dangerous. I thought that was Mary did I make a mistake somewhere. Oh Oh, there’s a Mother God I better start making plans. Are you still upset about that “Tree Of Life” thing?